TLC Citywest are delighted to announce Renny Joseph – CNM as our January 2019 Employee of the Month. Renny started working in TLC Citywest in June 2011 as a staff nurse and was promoted to CNM in February 2017. Renny has gone from strength to strength as a Staff Nurse and CNM. Renny is so humble and quietly does her job and looks for no praise or thanks yet she is very vocal when it comes to ensuring that she advocates for the residents and staff on her floor to make sure that everything is in order. Staff and residents are genuinely thrilled for Renny to have received this award and we are all very proud of her. 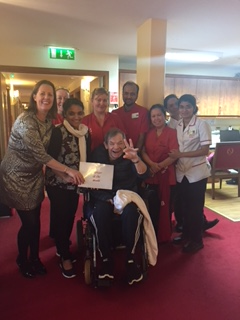 In the eight years that Renny has worked in TLC Citywest, she has never taken a sick day and we commend her for that as well as all her hard work and dedication.